A very elegant Japanese sand-cast iron tea kettle and brazier (furokama, fuuro-kama) of unusually small size (making water for one person). The round brazier (Furo) has an opening on each side; the kettle with a tapering top is finely cast with romping horses, loose ring handles and delicately shaped top with simple knob. The brazier with cast mark 'Nanbu, Morioka, sei(?) mitsu(koi) dou. Nanbu and Mizusawa of Morioka in Iwate prefecture (northern Japan) has been famous for cast iron wares. Morioka-Nanbu, in particular, has specialized in tea wares since the beginning of the Edo period (mid 17th century). Total dimensions: 6 1/4" in diameter x 5 1/2" in heighth (the kettle, 3 1/2" x 4"). Small but a heavy set. 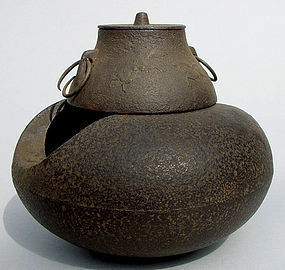 Chagama Large Pot for Japanese Tea Ceremony, Herons Japanese Bronze Vase, Okimono Hakata Ningyo Japanese Clay Doll, Tea Master "Rikyu"